Every now and then a product comes along and redefines its category. The Vector has done just that for water ski boots. A boot of tournament level performance built with the comfort of your house slippers. It’s also lower and lighter than any other available boot, keeping you in more control and aiding in a lightweight set-up. Cuff height has been set for great lateral stability and the 3-D molded tongue offers firm support, controlling forward pressure. FEATHERFRAME CHASSIS - Radar's Feather Frame is the first and only boot system to completely integrate the mounting system, base plate and comfortable outer shell all into a single component. This construction eliminates unnecessary screws and added plates, making it the lightest boot set up you can mount to a ski. This proficient weight reduction comes without sacrifice to the structural integrity of the chassis, supported by its rigid frame. 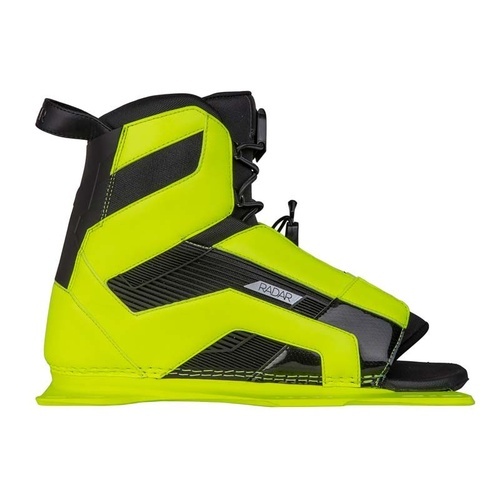 In addition to the streamlined effectual design, your feet are as close to the ski as possible for improved feel, energy transfer and reaction. The foot cradle inside the Feather Frame improves torsional foothold by eliminating lateral foot movement inside the shell. This chassis reduces a ski’s overall weight allowing for more ski control with less overall work. Proven lightweight performance. GLASS FILLED NYLON CONSTRUCTION – Unmatched strength to weight ration that drives an instant energy transfer from your foot to the ski. RIGID FRAME – Support structure prevents plate deflection and reacts on demand. 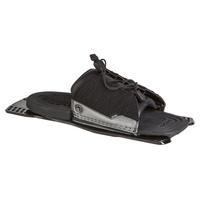 TORTIONAL STABILITY BAR – Chassis enables the ski to roll with your foot. BASELESS – Skier is closer to the ski for a better feel on the water.